While Southern California homeownership once symbolized the achievement of the California Dream, Los Angeles now has one of the most populated rental markets in the country. With 60% of Angelenos occupying the rental market, the city joins New York, Miami, and San Fransisco as major cities with the highest rates of renters. At the same time, Los Angeles is currently undergoing the largest development boom since the 1920s. The city built 10,000 new units in the 2017 fiscal year, many of which are high-end units in downtown Los Angeles. But who will live in these new luxury apartments? Not your average Los Angeles renter, who has seen double digit increases in rental costs in recent years. As of 2013, Los Angeles was the most rent-burdened city in the entire nation; 62% of the city’s renters spend more than 30% of their household income on rent each month. In fact, renters are having a hard time finding an affordable place to live anywhere in the greater Los Angeles region. The current median apartment rent in Los Angeles is $2,483 - one of the highest in the country. Furthermore, the city’s poorest individuals bear the brunt of this trend. Many are severely rent-burdened, meaning they pay more than 50% of their incomes toward rent. Since 1970, the percentage of severely rent-burdened residents living in the lowest 20% of the income distribution increased from 53.6% to 77.8%. In spending such a large portion of their incomes on rent, severely rent-burdened households have little extra money to support monthly expenses related to healthcare, transportation, utilities, groceries, and childcare. 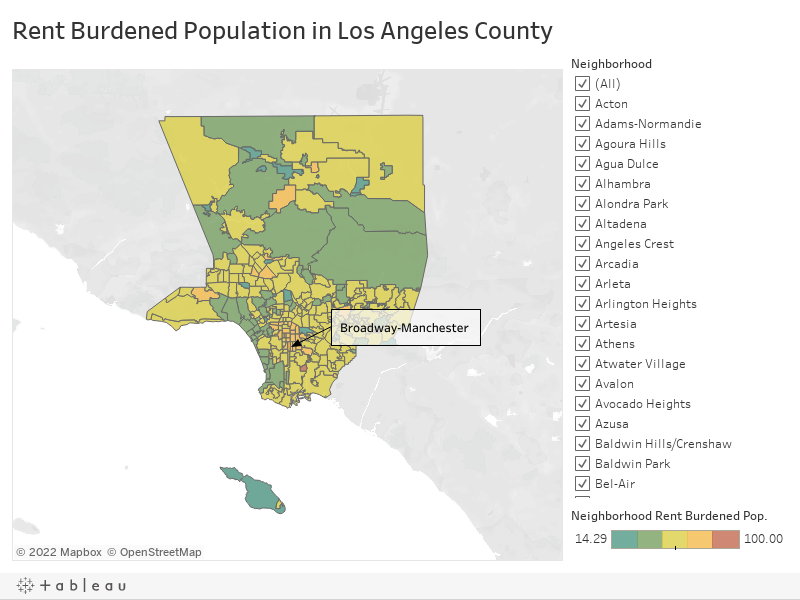 In the Broadway-Manchester neighborhood of south Los Angeles, 74% of the neighborhood is rent burdened according to the 2015 5-year American Community Survey data. The neighborhood's median household income is only $28,458 - half of the county average - while the average median rent is $1,156, a price that is considered unaffordable for the median household income of the area. The neighborhood has seen unemployment rise over the last five years; 14.8% of the population is currently unemployed - far higher than the citywide unemployment rate of 10.3%. These trends are common for low-income neighborhoods in south Los Angeles, and many residents in the region share the same housing plight as those in Broadway-Manchester. While the city’s poorest residents are hit the hardest by the simultaneous increase in rent costs and decrease in income, neighborhoods of all income levels are witnessing an increase in rent-burdened populations. In fact, the percentage of moderately rent-burdened Angelenos in the middle 60% of the income distribution increased from 9.8% to 34.8% over the past forty years. Northridge, a community in the San Fernando Valley region of the county, shows an example of high rates of rent burden in an economically thriving community. According to the 2015 5-year American Community Survey data, 61% of the population is rent burdened, a 15% increase from the 2010 reporting period. The median household income in the neighborhood is $61,699 - well above the county average - and the unemployment rate in the area is at just 8.1%. Yet rents in the area rose significantly between the 2015 and 2010 reporting periods. The median gross rent in the neighborhood increased by 36% in 5 years to $1,516 per month, while incomes only rose by 8% over the same period. Residents of Northridge are not alone in experiencing little to no income growth. Between 2006 and 2013, Los Angeles was the only major city to experience negative growth in median renter income (-4%) and an increase in median gross rent (+11%). Los Angeles has fewer publicly subsidized units and imposes weaker rent control policies than other cities. As of October 2017, the city's Section 8 Voucher waiting list will be opening for the first time in over 13 years. Housing experts estimate that Los Angeles needs to produce roughly 5,300 affordable housing units per year to keep up with the demand. The city has averaged only 1,100 units per year since 2006. As evidenced by the recent defeat of Measure S, rapid development of affordable housing is of top concern for the majority of Angelenos. But equally important is the preservation of existing affordable housing, particularly as property owners increasingly take rent-controlled apartments off the market and choose to terminate affordability contracts for low-income housing. According to the Los Angeles Times, approximately 20,000 rent-controlled units have been taken off the market since 2001. Furthermore, about 45% of Los Angeles’s Section 8 project-based rental assistance units are set to expire by 2017. This not only exacerbates rent burdens across the region, it contributes to the city’s homelessness crisis, as low-income Angelenos find themselves unable to afford market rate housing. The changing landscape of homeownership and renting in Los Angeles has shifted dramatically in the past decades. National, regional and metropolitan forces have converged in our city to drive down incomes, push up rents, and increasingly recast our city as one of majority renters rather than homeowners. In this context, it is necessary to understand the interaction of key factors such as rental prices and income levels, which affects Angelenos in general, but is having particularly sharp effects in some of our most vulnerable populations. Understanding rent burden provides us with a window into the changes that are defining Los Angeles, and an avenue into addressing the challenges brought by them, towards building a more just and equitable city for ourselves and future generations. Capperis, Sean; Ellen, Ingrid Gould; & Karfunkel, Brian. Renting in America's Largest Cities. NYU Furman Center. May 2015. Chiland, Elijah. Report: LA Apartment Construction is up 61 percent, but will it make a Difference for Renters? Curbed Los Angeles. August 2017. Clark, Patricia. A Lot of Cheap Housing is About to Get Very Expensive. Bloomberg. October 2015. Jimenez, Silvia; Ong, Paul; & Ray, Rosalie. Impacts of the Widening Divide: Los Angeles at the Forefront of the Rent Burden Crisis. Center for the Study of Inequality, UCLA Luskin School of Public Affairs. September 2014. Khouri, Andrew. L.A.'s Reality: More People Want to Live Here than here are Homes Being Built. Los Angeles Times. March 2017. Khouri, Andrew & Poston, Ben. More Rent-Controlled Buildings are being Demolished to make way for Pricier Housing. Los Angeles Times. April 2016. Watch "City Rising," a multimedia documentary program that traces gentrification and displacement through a lens of historical discriminatory laws and practices.